Pineapple, Mango and Kiwi Fruit Salsa: Mix together finely chopped fresh pineapple (about 2 large slices), 1 peeled and finely chopped mango, 1 peeled and chopped kiwi fruit, and 1 ½ tablespoons chopped fresh mint. Serve with grilled tuna. Pineapple is an excellent source of manganese and vitamin C, which is important for the healthy function of the immune system. Pineapple also is a good source of copper, fiber, folate, and vitamins B1 and B6. Cucumber and Green Chile Salsa: Mix together—1/2 cucumber (chopped), 2 seeded, deveined and chopped green chilies, 3 chopped tomatoes, 1 chopped small red onion, and a small bunch of fresh cilantro (chopped); season with salt and black pepper. Serve with grilled chicken, seafood, or steaks. Cucumbers offer a combination of valuable nutrients, including flavonoids, cucurbitacins, and lignans. These three phytonutrients provide anti-cancer, anti-inflammatory, and antioxidant benefits. Corn and Red Bell Pepper Salsa: Mix together 2 cups frozen corn kernels (thawed), ¼ cup chopped red bell pepper, 1/3 cup chopped red onion, 1 tablespoon finely chopped jalapeno pepper, 3 tablespoons chopped fresh cilantro, 2 tablespoons fresh lime juice, and ½ teaspoon salt. 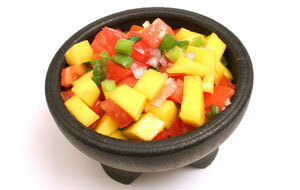 Cover and refrigerate salsa for at least 2 hours and up to 4 hours. Remove from refrigerator and let it sit for 30 minutes before serving. Serve with grilled meat or poultry. Bell peppers are an excellent source of vitamins A, B6 and C and a very good source of fiber, folate, and potassium.